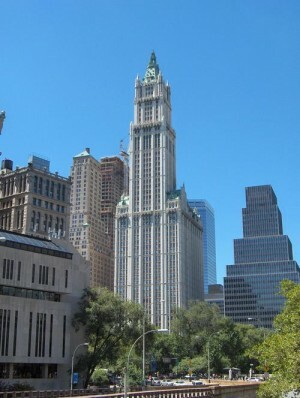 The Woolworth Building, at 57 stories, is one of the oldest—and one of the most famous—skyscrapers in New York City. 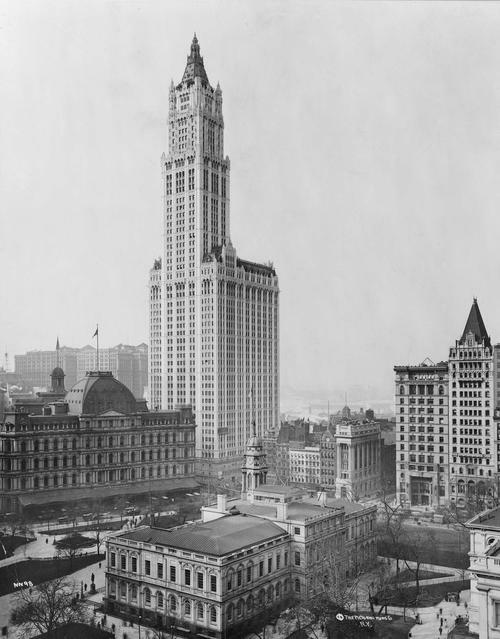 More than 95 years after its construction, it is still one of the fifty tallest buildings in the United States as well as one of the twenty tallest buildings in New York City. The building is a National Historic Landmark, having been listed in 1966. The Woolworth Building was constructed in neo-Gothic style by architect Cass Gilbert, who was commissioned by Frank Woolworth in 1910 to design the new corporate headquarters on Broadway, between Park Place and Barclay Street in Lower Manhattan, opposite City Hall. Originally planned to be 625 feet (190.5 m) high, in accordance with the area's zoning laws, the building was eventually elevated to 792 feet (241 m). The construction cost was $13,500,000 and Woolworth paid all of it in cash. 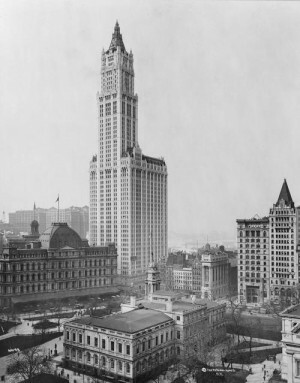 On completion, the Woolworth building overtook the Metropolitan Life Insurance Company Tower as the world's tallest building; it opened on April 24, 1913. With splendor and a resemblance to European Gothic cathedrals, the structure was labeled the Cathedral of Commerce by the Reverend S. Parkes Cadman during the opening ceremony.